The correction that must be applied to apparent solar time to obtain mean solar time, i.e. it is the difference in time as measured by a sundial and by a clock. The equation of time varies through the year; it has two maxima and two minima and is zero on four dates: April 15/16, June 14/15, Sept. 1/2, and Dec. 25/26. A positive value indicates that apparent time is ahead of mean time; the greatest positive value, which can be over 16 minutes, occurs in early Nov.; the greatest negative value, over 14 minutes, occurs in mid-Feb. The curve is the sum of two components, each reflecting a nonuniformity in the apparent motion of the Sun: one component arises from the ellipticity of the Earth's orbit, the other from the inclination of the ecliptic to the celestial equator (see mean Sun). 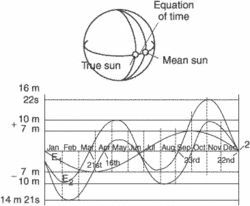 the difference between mean solar time and apparent solar time, equal to the difference between the right ascensions of the true sun and the mean sun. The equation of time is often defined as the difference between apparent time and mean time; in this case, the equation has the opposite sign, a fact that must be borne in mind when reference books are used. The equation of time varies continuously. The variation is due to the fact that the passage of apparent solar time, as measured by the hour angle of the true sun, is nonuniform because of the nonuniformity of the earth’s orbital motion and the inclination of the ecliptic to the equator. Therefore, the equation of time is obtained by adding two waves of approximately sinusoidal shape and nearly equal amplitude (see Figure 1). One of the waves has an annual period; the other, a semiannual period. The equation of time is equal to zero four times a year—around Apr. 16, June 14, Sept. 1, and Dec. 25. Four times a year it attains the following largest absolute values: +14.3 min (around Feb. 12), –3.8 min (around May 15), +6.4 min (around July 27), and –16.4 min (around Nov. 4). where m is the mean time, m0 is the apparent time, and η in is the equation of time. The addition of a quantity to mean solar time to obtain apparent solar time; formerly, when apparent solar time was in common use, the opposite convention was used; apparent solar time has annual variation as a result of the sun's inclination in the ecliptic and the eccentricity of the earth's elliptical orbit. The amount of time by which the mean sun leads or lags behind the true sun at any instant. Its value is positive or negative, depending on whether the true sun is ahead of or behind the mean sun. Its value never exceeds 16¼ min. It is the correction applied to 12 h + local mean time to obtain the local hour angle of the sun. As the sun seems to slow, the equation of time takes over as the dominant factor in sunrise and sunset times. Starting in the 18th century, timepieces began to display new astronomical indications of a more scientific character, such as the equation of time, sunrise and sunset times, star maps, planetary indications or the hours of the tides. Also on the back is a graphical scale for finding the Equation of Time correction for any date, using the alidade as a rule. Equation Of Time was another wide-margin handicap winner at Dundalk but he gets away relatively lightly, going up 11lb to 75. Near the midnight line is a white curve labeled Equation of time weaving narrowly right and left down the chart. Thankfully, people have already calculated this variation, and given us the Equation of Time, which tells you how many minutes you need to add or subtract on a certain day of the year. Keeping A Sundial In Time With The Clock Requires Careful Calibration: Are You Prepared? Don't dismiss Equation Despite being more than 20lb wrong on the ratings with some of the opposition, Equation Of Time shouldn't be dismissed lightly. A IT'S due to a phenomenon called the equation of time, which is the difference over the course of a year between time as read from a sundial and time as read from a clock. The section on the analemma and the equation of time is a good example. Shadows can generate graphs and tables of the equation of time for an entire year. The difference between local noon and the moment when the Sun actually crosses the meridian is called the equation of time and is well known to anyone familiar with sundials. If one were to photograph the Sun at local noon every day for a year, its path against the sky would be a drawn-out figure eight, owing to the changing solar declination and the equation of time.